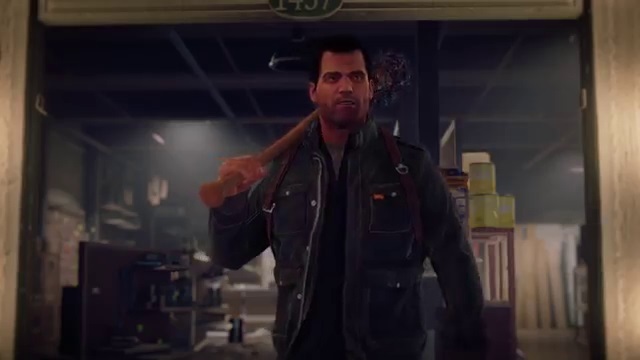 One of the biggest surprises for me of E3 was the fact that the legendary Frank West would be returning in Dead Rising 4. While I’ve only ever played a bit of Dead Rising 2, I do know of Frank from his many other cameos. In particular, the first Project X Zone, where I loved the guy. So to see him return and be playable on the show floor meant just one thing to me – time to go kill some zombies! 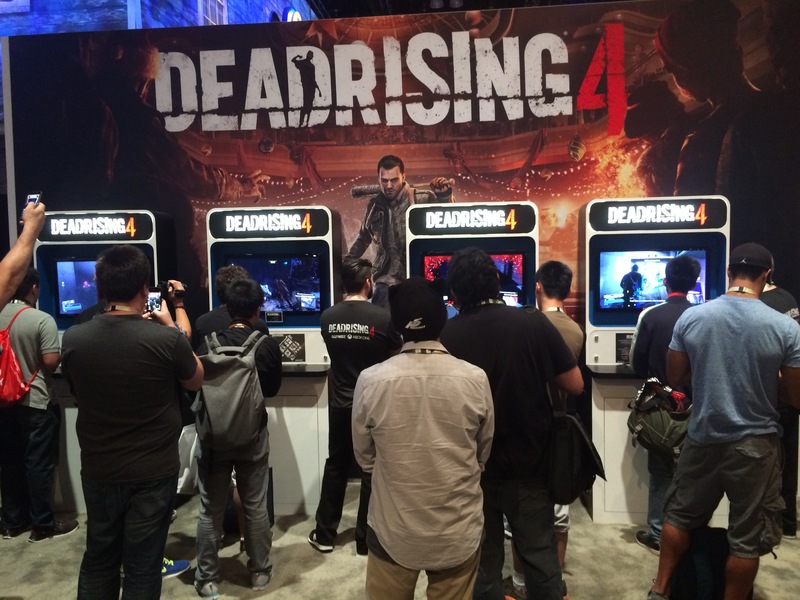 Dead Rising 4 takes place in Williamette, the city of the original outbreak from the first game. While this game features the return of many series staples, such as the combo weapons from Dead Rising 2, there’s one new mechanic that Capcom is making a big deal about: The Exo-Suit. Now Frank is no stranger to using technology. 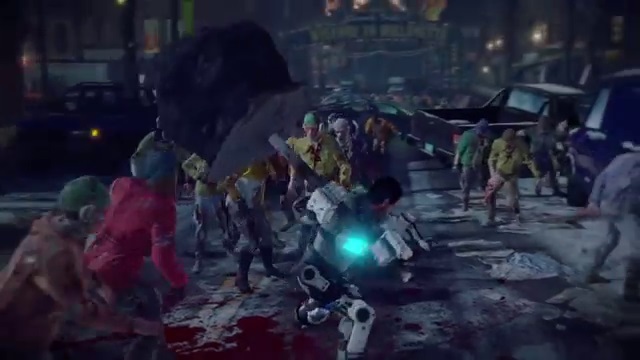 In the first Dead Rising, for example, you could get a working Mega Buster. This time though the Exo-Suit not only allows you to plow through the hordes, but also gives you access to several heavy weapons. This also includes pulling street signs out of the ground with chunks of concrete attached to it. This is what I went with for my primary weapon and it was glorious. This was my weapon for most of the demo. While you can just whack zombies with it like a giant mace, I found a better use for it. Batting practice with cars! 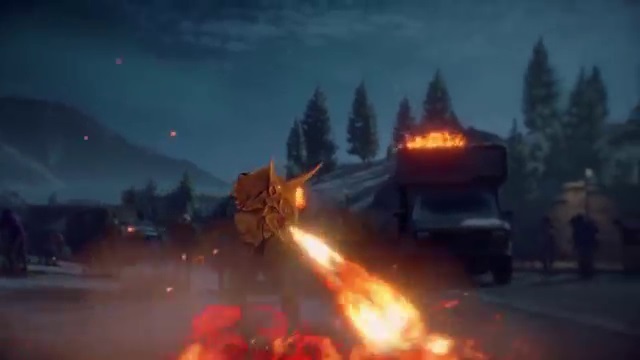 Yes, I was able to actually hit parked cars with the chunk of concrete on a stick I was wielding and send them flying into the hordes for massive damage. I actually did this completely by accident the first time. The second time I tried to do it I ran into a small problem. One car just would not even register being hit. The next car I tried seemed to have a very finicky hit box and didn’t want to quite register the impact. After maneuvering around to the other side and fiddling around with my positioning I was able to get it to go flying, though. So why bring this up? Looks like Frank’s going to have a holly jolly Christmas. Well it’s because I want to highlight something people often forget about demos. Sometimes, things just don’t go right. Development Teams only have so much time to get these demos built and polished. While I think it’s fair to expect that they should be as close to perfect as can be, there are times when you have to take the game into account as well. Dead Rising 4 is one of those cases. This is an open sandbox game and as such it’s really hard to test every little thing a player can do. It’s not a guided demo like Final Fantasy XV. I expect things to sometimes be a little rough and I think it’s a testament to how good the demo was, because you know what? Despite these minor hiccups, I had a lot of fun and I’m sure these issues will be worked out when the full game releases. Let’s get back to my playthrough though. The weapons this time seem to be getting quite creative. After my little car experiment, I continued to push my way through the zombies until eventually my suit ran out of power. From there I just made my way to the Fire House where the game had told me to go in the beginning. Shortly after I arrived, the demo’s time ran out and I was unable to do anything else. What I do know from watching others play is that inside you need to take some photos of some dead responders for Frank’s investigation. Meaning that yep, Frank’s famous camera is back. So how do I feel on the whole about Dead Rising 4? I really enjoyed my time with Dead Rising 4. 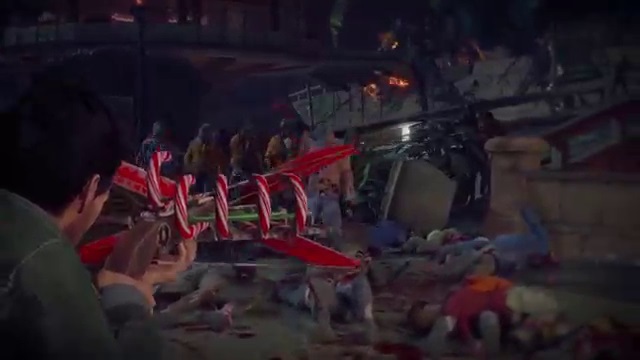 I really think Dead Rising fans are in for a treat. Frank coming back is just the cherry on top, really. The game looks and feels really good. Despite the minor hiccups I encountered, I never saw a frame drop or slowdown. The Xbox One hardware held up really well. The combat feels great and the new Exo-Suit is just a blast to use. I imagine Frank is going to go up against more militaristic foes due to the suits’ inclusion, but that’s why we have a shadowy organization which is in the city already. All in all, Dead Rising 4 is something to very much look forward to and the guys at Capcom have done well in keeping the series alive.